The building's focus and central feature is the Great Hall, used for large Academy meetings until completion of the auditorium wing in 1970. Interior view of the dome of the Great Hall © 2012 Maxwell MacKenzie. point from the south spectator gallery. The Great Hall is cruciform in floor plan and is vaulted, with its dome rising to a height of 56 feet at its apex. 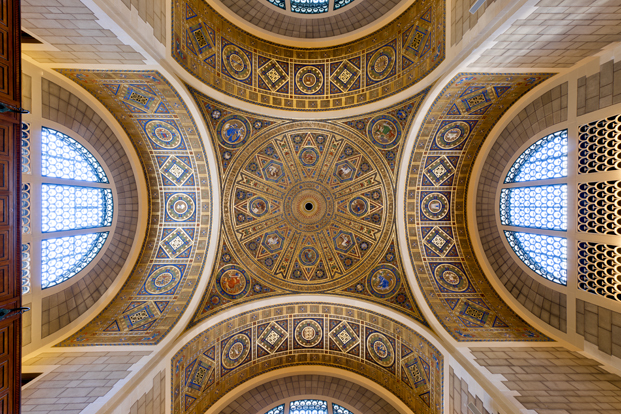 The dome and its supporting elements are decorated with images, symbols and inscriptions that illustrate the history of science and of the scientific societies that predated the National Academy of Sciences. 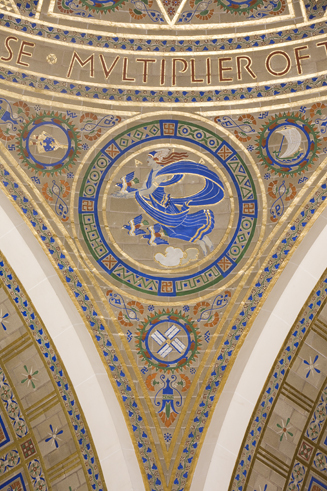 The decorations on the dome of the Great Hall were created by artist Hildreth Meière (1892-1961) as her first commission and painted and gilded by The Mack Jenny & Tyler Company, based on Meière's full-size drawings.10 All of the designs are done in the streamlined Art Deco style that became a Meière trademark. Radiating outward, beyond the band of planets are eight trapezoidal panels, each representing a scientific discipline. 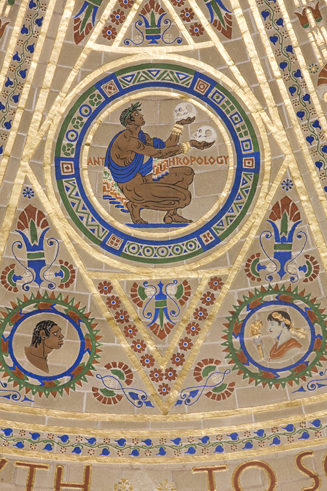 Within each trapezoid is inscribed a hexagon containing an inscription identifying the science and a central human figure deeply engaged in research. At the base of each trapezoid are two smaller flanking medallions depicting objects, tools, or ideas emblematic of each science. 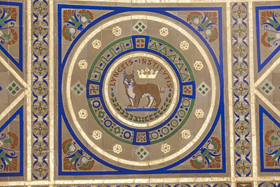 See complete description of the details of the ceiling of the Great Hall or download an app for iPad at iTunes. The dome is supported on pendentives, sections of a sphere that allow the transition from a square ground floor to a circular dome. Each of the four pendentives is decorated with allegorical female figures representing earth, air, fire, and water. Adjacent to each figure are three small medallions representing inventions related to that natural force. Three elevated galleries, along the east, south and west sides, are designed to seat audiences for lectures and programs presented on the floor of the Great Hall. The soffit arches over the galleries and over the north wall display Meière's interpretation of the insignia of four of the world's oldest academies of science and two examples of their achievements. Meière, depicting the Anthropology medallion. Photo: Mark Finkenstaedt. Cultural Programs of the NAS. medallion on the northwest pendentive. Detail of the Great Hall dome depicting the crowned lynx of the Accademia dei Lincei, Rome on the east arch. Photo: Mark Finkenstaest. Cultural Programs of the NAS. 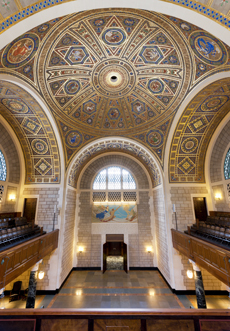 The dome of the Great Hall represents Byzantine architectural influences in Goodhue's reinterpretation of the Classical style. The dome was unknown to classical Greek architecture, which relied on post-and-lintel forms, but the dome was characteristic of the Byzantine style. Meière's decorations, with their geometric patterning, their heavy use of gold and their two-dimensionality, are consistent with the subordination of realism to symbolism in Byzantine art. The Byzantine flavor is further accentuated by the mosaic-like appearance of the paintings. On the north wall of the Great Hall is a magnificent mural by Albert Herter (1871-1950)12 portraying Prometheus, aided by Athena, stealing the divine fire from Helios, the sun god, as he drives his chariot across the heavens, to bring the flame of knowledge to humankind. Herter followed ancient Greek and Egyptian design conventions in naming the figures in the mural. Below the image is a lengthy quotation, describing the beneficial effects of reason, purpose, judgment, and science. The quotation is from the play “Prometheus Bound” by Aeschylus, as translated by Herbert Weir Smyth.13 As first conceptualized, the mural was to be a symbolic representation of science, a depiction of Prometheus joined by the “spirits of research looking on.” In the final painting, Athena, the goddess of knowledge, is the allegorical embodiment of the spirit of scientific research. Albert Herter’s mural depicting Prometheus is located on the north wall of the Great Hall. From the building's opening until the late 1930s, the Great Hall was used for Academy meetings and the galleries in the overhanging balconies provided seating for the members at the Annual Meetings. The galleries and the Great Hall itself were converted to office space during the World War II. These magnificent spaces, unlike the exhibit rooms described below, were restored to their original configuration at war's end.